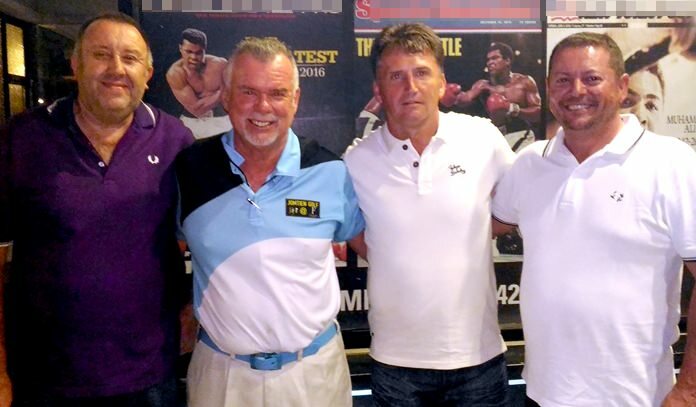 From left: Keith Woolley, Dennis Scougall, John Hughes and Mark Potton. We were playing off the white tees today with an exact cut of 7-15.7, 16.0-20.3 and 21+ in the three divisions out. Les Smith recorded the highest score, winning division 2 with 38 points while Barry Stirling came second five points behind and Dave Howden and Joseph Toner were a further five and six points back in third and fourth. Jerry McCarthy took division 1 honours, beating Pete Sumner on a 18/17 back-nine count-back after they both came in with 36 points each, Brian Keating was third on 35 and Paul Young came fourth with 33. There were two 33-pointers fighting for podium position in division 3 and Andrew van De Laan beat Mike Fitzgerald on a 17/13 back-nine count-back. David Phillips was third on 32 and Alan Bissell took fourth with 30. Near pins went to (Div 1) Brian Keating, Pete Sumner and Paul Young, and (Div 2) Mike Fitzgerald, David Phillips (2) and Bryan Rought. Les Smith and Pete Sumner shared the ‘2’s pot with a rollover in division 1 and the Welsh boy David Phillips birdied the 15th to clean up in division 2. After Wednesday’s washout at Bangpra the forecast here in Baan Chang today was very positive and we had an amazing twelve groups of four-balls out. There were 43 in the competition with the cut set at 7-14.6, 14.7-20 and 21+ in the three flights. Jim Connelly came in with the best score of the day to win division 2 with 40 points. Colin Aspinall was second on 36 and Paul Sturgeon beat Paul Young into third place on a back-six count-back after they both scored 32 points overall. Leo Adam topped division 3 with 38 points, Mike Fitzgerald was second with 36, Juergen Heinzius took third on 33 and Rudi Schaefer was fourth with 32. Dennis Scougall won division 1 with an even par 36 points, John Chambers was second one point behind and Mark Potton beat Jeff Cordeiro on a 16/15 back-nine count-back for third. Near pins were claimed by (Div 1) Chuck Anderson, John Chambers, Dennis Scougall and Les Smith, and (Div 2) Henning, John Hughes and Bill Kana. There were three ‘2’s on the 17th today in division 1, coming from Chuck Anderson, Dennis Scougall and Les Smith and they split the pot. There were no ‘2’s recorded in division 2.